KATHMANDU, Sept 20: Various agitating political parties and other groups aligned with the Federal Alliance and United Democratic Madhesi Front (UDMF) have staged demonstrations in Kathmandu and several other districts as a protest against some of the provisions in the constitution, which was promulgated on September 20 last year. A group of protestors staged demonstrations at Maitighar Mandala in Kathmandu and another group at Ratna Park in the capital city on Monday. They termed the day as black day. The Madhes-based parties have been continuously protesting against the constitution terming some of the provisions as discriminatory against the Madhesi people. The protestors of the different groups wearing black armbands and black bandanna strips on their heads took out separate rallies in Kathmandu. They also staged demonstrations calling the public to switch off lights across the country to protest the constitution in the evening on Monday. Madhesi leaders took out protest demonstrations as per the decision of the UDMF. UDMF leaders and cadres burnt copies of the constitution in the morning. People were carrying black flags and banners in a demonstration, which started from Ghantaghar in the afternoon. The demonstration converged into a corner meet after passing through major streets of the city. Addressing the gathering, Madhesi leaders said that the constitution was promulgated unilaterally without the consent of Madhesi leaders. General Secretary of Nepal Sadhbhawana Party, Shiva Patel said that the major political parties are not serious toward addressing the discontent over the new constitution. 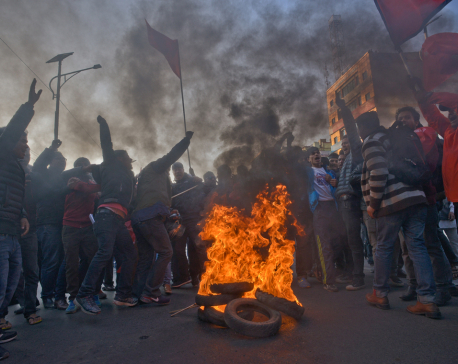 Chairman of Federal Socialist Forum Nepal, Parsa Chapter, Pradip Yadav said that the protest will continue unless the government amends the constitution to address their demands.